Posted on May 5, 2013	by Platanos, Mangoes and Me! This soup came to be as I was lying around recouping from my fractured shoulder, yes another bump for me. It was a gloomy day in New York City when I turned on the TV and here was the Barefoot Contessa preparing her Italian Wedding soup. It looked so comforting that I ran walked slowly to the fridge. I had most of the ingredients except for the chicken sausage. Also, she used carrots and celery in the broth and left it in the soup. I used it to give it more flavor and then discarded it. The carrots you see there and used at the end as I like my veggies a little crunchy. Chop the spinach and placed on bottom of each bowl before pouring the hot soup over them to keep the color. I am not a left over person, but ladies and gents this soup fed us for three days straight and the husband said it was one of my better soups, I agreed. 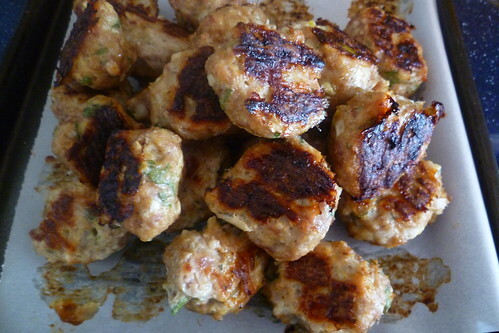 Mix all the above, make meatballs and bake in oven at 350 degrees for about 30 minutes. Heat the olive oil over medium-low heat in a large soup pot. Add the onions, carrots and celery and cook for about 10 minutes, stirring occasionally. Add the chicken stock and wine and bring to a boil. Reduce heat and continue until carrots are soft, the remove all so you have a flavorful stock. Add the meatballs and diced carrots. Then about 10 minutes later add the pasta and cook until al dente. Add spinach to you plate, ladle soup and garnish with dill. 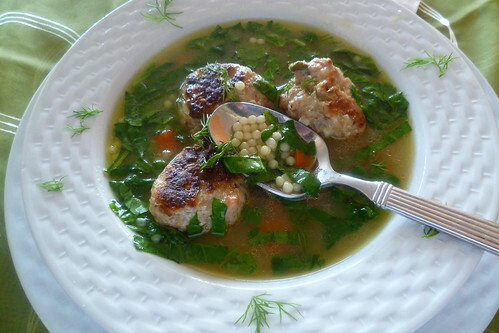 This entry was posted in Appetizers, Chicken, Italian, Italian Dishes, Pork, Soups - Cold/Hot. Bookmark the permalink. One of my favorite soups, so easy and very fresh and yet, so satisfying! I have some leftover turkey meatballs sitting in the fridge. I see this soup in their future. Guess what? I have sausage & i just bought some ground turkey (i know its not chicken!) Sounds super easy, i can do that…As usual yummmy……. 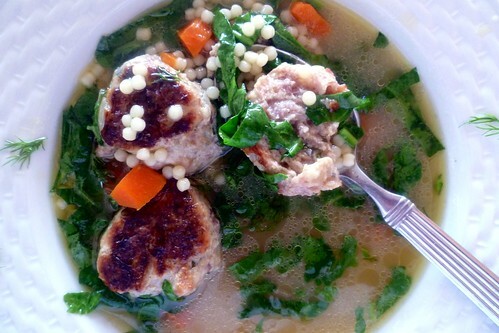 I love the combo of chicken and pork…the meatball soup looks hearty and comforting. A winner. Like the idea of not cooking the spinach and adding with diced carrots to the bowl. It looks so tasty Norma!! You know I am a sucker for albondigas in a soup!! Can’t wait to try it! Fractured shoulder????? Sweetie. I hope you’re better. Talk soon – this is a wonderful looking soup. I hope you are feeling better Norma! This soup is comfort in a bowl! Those meatballs look amazing! I could happily eat this for an entire week.